Yes, I’m pretty excited about this! The announcer even told the crowd they were seeing the ride of the day when I came through moving from 58th to 13th. Pretty sweet. 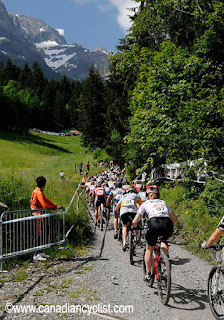 Saturday July 9th I raced my 2nd World cup of the Season, this time in Champery, Switzerland. 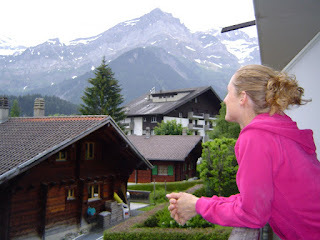 Champery is situated in the South East corner of Switzerland in the Alps. Sandra, myself, kris and Wendy headed there from Central Switzerland on Wednesday. We checked out the course that day and Sandra and I felt just horrible on it, getting tossed around the rough rooty descents. Some tire and fork pressure adjustments made a huge difference for next lap. The course would start into a steep 1km climb before turning into the woods and a rough steep descent. It then crisscrossed through some rooty single track with a couple of drops before heading down the WC 4 cross course, over some roads and out onto the other half of the course. The course was pretty interesting as the two halves were quite different. This side of the course was all slightly up and then slightly downhill and predominantly through singletrack using paved roads to connect sections. Roots were a major characteristic of this side as well with most riders having to cyclocross one large gnarl of roots. It was going to be an interesting race as fast laps were sub 20 minutes and the course held both my typical strengths (steep up and downs) and my weaknesses (flat to undulating power stuff). Saturday morning was stunningly beautiful. At 8:30 it was comfortable outside in a tank top and we had a clear view of all the surrounding Mtns including the Dents de Midi (think toblerone bar). The women were to be racing 6.5 laps and after last weekends 27th place finish I moved up to a starting position of 58th. For the start we were herded up to the top of the 4x course and as each rider was called up we descended down into the start box. At 11:00 the gun went off and 92 women jockeyed for position. It was incredibly frustrating when we hit the climb and I got completely boxed in. With 60 women in front of you on a narrow steep off road climb there’s very limited opportunity to move up. I was forced to go into my granny gear to keep upright at that pace even dabbing once or twice. When the climb switchbacked and opened up I was ready. I slammed it into a big gear, stood up and passed about 20+ girls before the first Singletrack. This is when I received my animal attack. Although most girls were running the descent due to traffic I tried to ride it. A girl went down beside me and brought her bike up and started running, but her chain ring was lodged behind my knee. After that things went pretty smoothly. I passed as many girls as I could when I could and by the end of 1.5 laps I was in the top 20. I rode smooth, but aggressively all race as was able to work my way up to 13th by the end of the race….only 17 seconds off 12th and a position in the Olympic pool!!! Gotta make that top 12 June 23 in MSA, Qu. Fionn and Jill From Griffiths Racing (Norco) were there and my Super fans cheering their lungs off at at least 4 points on the course per lap. Fionn went on to get her first World Cup podium of the year that evening finishing 3rd in the 4cross. My Norco Hardtail performed like a dream and Sram was there providing excellent support. Thanks Sylvain for the feed!